So he’s a third baseman who doesn’t wear a cup, he can deliver unmatched death stares to teammates, he’ll freak out if you touch his head, he likes to appeal his own check swings to the first base umpire, and he frequently drops to one knee when crushing a pitch. 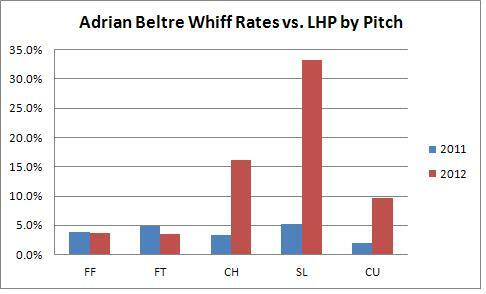 For these and for many other reasons, Adrian Beltre is just a lot of fun to root for. On top of it all, he’s been a terrific third baseman in fantasy baseball circles as a player you can rely on for a plus batting average, great power, and tons of RBI. But there’s been an interesting trend in 2012 that might be a short-term quirk, or perhaps a sign of a problem going forward. Beltre owns a current slash line of .296/.325/.483 with ten home runs, 30 runs scored, and 37 RBI, so he’s performed as most would have expected on the season. But his last couple of weeks haven’t been at all useful to fantasy owners. Since May 28th, Beltre his hitting .233/.292/.283 with no home runs and just three doubles over 65 plate appearances, and he’s struck out 16 times. His BABIP during that period is fully .318, so he’s actually getting lucky bounces right now. This is, of course, a small sample and it’s likely to register on the spectrum of what goes up must come down. Still, there are a couple of other interesting tidbits to be aware of. In fact, when he has swung at a slider from a left handed pitcher, he’s missed it 70% of the time. Against the curveball, it’s almost 40%. In 2011, it was 19% and 7%, respectively. The sample size is pretty small, so take it with a proverbial grain, but Beltre is either struggling with the pitch recognition or simply having a tough time making contact with most secondary pitches from left handed pitchers, where he has historically punished them. If you want to point to luck, there is some evidence that things aren’t rolling his way against lefties. His BABIP on the season is .235 and based on his hit trajectory, it should be around .290. This is somewhat wrapped up in a 50% ground ball rate to date, which is about ten percent higher than his career norm. But it doesn’t necessarily explain away the power issues and the swings-and-misses as Beltre has 14 seasons of evidence to suggest he should be killing lefties. Now, I can’t see managers employing the bizarro-platoon and running a lefty specialist to the hill in high leverage situations to lob curve balls to Adrian Beltre, so it’s not likely to become a problem that’s bigger that it already is. And if you want to think positively — that is, if you think he’s due for some healthy dose of regression against lefties, well then maybe he’s in for a real boost in the power department in the coming weeks. 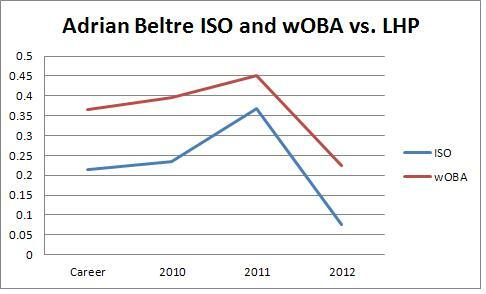 But over 70 plate appearances against lefties in 2012, Beltre has pretty much been lost, which is easy to ignore given the strength of his overall line. I’d say this is something to monitor loosely, if only because Beltre is 33 and ought to be on the slippery side of the aging slope. It could be a signal that his skill set is starting to suffer, or it could simply be random noise. For now, Beltre is still pretty awesome. We hoped you liked reading Adrian Beltre and Left Handed Blues by Michael Barr! As someone who watches a majority of all Rangers games, it’s not just Beltre lately, it’s a team wide slump, the offense has been on ice the entire month of June. I don’t think 9 good hitters just turned bad, but there have been stomach bugs going around and who knows what else. Kinsler has stopped walking, and him and Beltre both have been striking out far more than they have in the last few years. Hamilton has homered once in the last 13 games and it was to the deepest part of SF of all places. I’d mark it down as SSS and a team wide epidemic. 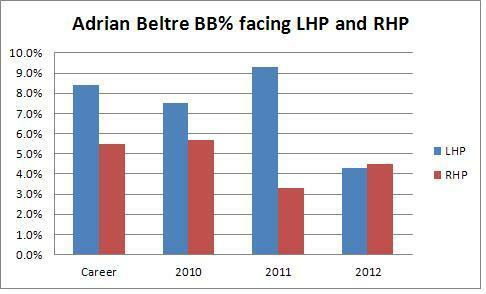 Last year Beltre was having a so so year before he came off the DL and caught absolute fire in September. Don’t fret too much, have patience.